Listify is the most versatile directory theme for WordPress. The mere plethora of features it provides separate it from its competitors. A simple, visually appealing interface and ease of use further justify our case. The theme boasts a 4.5-star rating and 14000+ downloads on Themeforest. But bragging about this responsive theme is not our mission here. We went ahead and actually tested this theme and fashioned it into a custom rentals site. You might already know the lucrative appeal of owning a rentals website. Gone are the days when you had to frantically scout for apartment listings in newspapers, coffee shops, and random notice boards. With the advent of digital directories, searching for apartment listings and finding a perfect home is now a cakewalk. Starting a rentals website with Listify is a great option to generate revenue. Sure, Airbnb is the market leader but you can easily create a niche user base with Listify, and gradually increase your reach. So let’s dive straight into the metrics of such a site. This plugin allows you to set up bookable products for various services including rentals. You can customize the bookings by dates, cost, and duration, which can be purchased just like other WooCommerce products. The installation process is the same as any other plugin. Just upload the .zip file in your plugins menu and activate the extension. Once the plugin is active, a “Bookings” menu will appear on your dashboard. It also adds a new product type called “Bookable Product”. Bookable products include attributes such as availability, pricing, resources, etc. After a successful installation, you are now ready to add a new rental listing. When a customer proceeds to check out with a bookable product (i.e, a listing), a new order and a new booking are created. The order is used to track payment while the booking has details about the service booked and stores the customer’s information. With such handy features, WooCommerce Bookings is an essential requirement for setting up your rentals website with Listify. To buy the plugin and for more information, click here. A lengthy checkout process causes leads to drop out of buying your product. Account creation and entering checkout information increase the duration of the process, thus causing leaks in your conversion funnel. WooCommerce Social Login can increase your conversion rate and improve your sales. For first time customers, the checkout can be made easy by allowing them to make the purchase as a guest. But if you want them to be your recurring customers, then you must have a better option on the table. WooCommerce Social Login makes the checkout process easy and secure. Your customers can login using their Facebook, Google, LinkedIn, PayPal and other accounts instead of making a new user account which is a tardy process. This is also a paid plugin but is worth the extra dollars. You can buy the plugin here. You can generate revenue by charging users to create a new listing on your site. You can also create listing packages to allow listing submissions for a custom length or the total number of submissions. When users create listings, they expect to make ample money out of renting out their listings. This plugin allows the listing owners to generate revenue on each sale, thus monetizing their listings. This is a crucial plugin for your site. You can also generate more revenue by taking a commission for each listing that the owners sell. This useful plugin allows your users to communicate with each other. This one on one communication ensures more activity on your website. Your users can also keep their conversations active using a custom messaging dashboard. Statistics allows you to track views, clicks and easily monitor activity on your listings. It also offers your users the opportunity to see their own statistics for any period they like. With this plugin, you can allow users to manage their map presence by choosing exactly where their business is actually located on a map. This ensures the listings are found on your website as well as Google. A robust review system is a must-have accessory to assess the quality of your website. With this extension, you can oversee how users leave reviews on your website. This plugin enables you to provide a badge of verification to ensure site visitors that your listing information is up to date and relevant. A claimed listing ensures the business owner’s ability to update his/her listing. With such lucrative plugins in one single bundle, this purchase would be a guaranteed steal. You can buy this bundle here. With Labels, you can allow your users to easily refine search results by adding one or more label requirements to their current search parameters. This ensures that not only are your guests finding relevant results but also your website’s listings are being discovered easily. You can also allow your listing owners to choose from a predefined list of labels set by you, or let labels be generated automatically by keywords entered by the listing owner. Giving listing owners the power to choose how their listings are found is a great feature that will distinguish you from other websites. You can buy this plugin here. This handy plugin allows you to add your listings to your favorites list for faster browsing. You can also add notes to each favorite so you can remember exactly what you liked about a particular listing. If users are able to find past listings easily then it helps increase your user interaction. To find out more or to buy the plugin, click here. Astoundify has done a commendable job with Listify. If you are serious about starting a listing website (which is a great decision), then you should definitely consider Listify and the plugins that we are suggesting. Simply put, these plugins will help you focus only on your core business while helping you with marketing and analytics. They also increase your overall user experience. Go check out the plugins and let us know if we have left out any cool plugin in the comments section below! How to Setup Listify Theme for WordPress Like a Pro! Staring hopelessly at our computer screens with a ‘what now’ expression on our faces. Sure googling for the next steps can help. But then you’re left trying to piece together bits of information to build a decent solution. Things don’t always have to be this way. Especially when dealing with Listify setup! And more… without importing the demo content. Now, I’m going to assume you have purchased the Listify theme and are ready with a fresh new WordPress installation. Step 0, is installing and activating the Listify theme! Once you activate the theme, you need to install the needed plugins. Liftify recommends 10 odd plugins to be installed. However, out of the plugins listed, WP Job Manager and WooCommerce are the only plugins that are required. The others are recommended but not required. Instead of installing all the recommended plugins, I’d recommend you install only the required plugins to begin with. With Listify, the listings are completely managed by the WP Job Manager plugin. So, let’s start by installing and activating the WP Job Manager plugin. WP Job Manager does provide a setup wizard, but Listify recommends you skip it, and manually create the pages. Why is the setup wizard not recommended? The reason could be because WP Job Manager creates pages for Job creation, editing and listing; with manual page creation you have the flexibility to create pages for listings of your choice- for e.g. listings, restaurants, services and so on. Not a problem! Owing to the use of shortcodes, setting up the pages manually is pretty easy. Submit Listing: Create a page named ‘Submit Listing’ and add the [submit_job_form] shortcode and publish the page. Do note: Submit Listing and Edit Listing pages are required only if you want to allow other users to add and manage their own listings. Edit Listing: Create a page named ‘Edit Listing’ and add the [job_dashboard] shortcode on it and publish the page. Listings: The Listings page displays submitted listings. To create this page, add the [jobs] shortcode on it, and name it Listings. Set the ‘Listings’ template for the page, and publish it. Once the pages have been created you’ll need to update WP Job Manager settings. Just head over to Listing -> Settings. Here you’ll be able to adjust WP Job Manager settings according to your preference. Account Role: If you’d prefer the account role to be different, for example say ‘Owner’, then you’d have to change the value of this option. Listing Duration: If you do not want listings to have an expiration date, clear this field. Under ‘Pages’ you will have to set the listing pages you have just created. Remember to always save any changes made. WooCommerce is used as the e-commerce cart on your listings website with Listify. Once again, Listify recommends that you do not use the setup wizard, and the reason’s the same. Since there isn’t a conventional store on your listings website, you probably do not need all the pages WooCommerce will create. But instead of skipping the use of the on-boarding wizard altogether, here’s what I’d recommend. Just skip the first step, so that you do not create any pages. You can set the rest of the options as per your need. Create a new page, add the WooCommerce My Account shortcode [woocommerce_my_account] on it, and publish the page. This page will allows users to login/logout from the frontend, and will also help them track their purchases/bookings. So, up until now, we were focused on the backend. Let’s move our attention to the frontend for a while. Your listing website needs a super amazing homepage. But when building one, just make sure you do not ignore essential elements. By far the most important element is the search option. If you’ve noticed popular listing websites, this option is placed prominently right when the homepage is loaded. And you must’ve noticed the same on Listify’s homepage demo. To create the homepage, create a new page and set ‘Home’ as the page template. You should be able to see the search option displayed on the page. PRO TIP: To set an image as the background image of the search option, set it as the feature image of the page. A great feature about selecting the ‘Home’ template, is that you can add additional sections as widgets under ‘Homepage’ widgets. For example, as shown in the Listify demo, you can add a category image grid, and recent listings. Why am I not able to see the listing categories section, even though I’ve added the widget? This is because you do not have any listing categories added. Try creating a couple of listing categories and add listings to the category. Alternatively, if you wanted complete control on the homepage design, you could use a page builder plugin like Visual Composer and leave the template as default or set it as ‘Home (Visual Composer)’. Now, once the page is ready set this page as the ‘Front Page’ under Settings -> Reading. Create another blog page and set it as the ‘Posts Page’. The primary menu is the top navigation bar, and is the ideal location to add the login option (or the ‘My Account’ page). The secondary menu is where your main menu items can be added. By default Listify adds the ‘Browse Category’ menu option to the secondary menu. The tertiary menu is an optional menu, which can be displayed on certain pages using the ‘Show tertiary navigation bar’ option in Page settings. This menu is displayed below the page title. Wondering how to add an icon to each menu item? It’s simple. Under Appearance -> Menu -> ‘Screen Options’ check the ‘CSS Classes’ option. Listify loads Ionicons, so you can use the icon name as a class to show the icon next to the menu name. For example, to display a clipboard icon next to the ‘Listings’ menu, set ion-clipboard as the CSS Class for the menu. The Listify theme provides a three column footer. You can head over to Appearance -> Widgets and add widgets under Footer Column 1/2/3 to display information in the footer. The call to action right above the footer is also part of the footer and can be edited using an option under Appearance -> Customize -> Footer. There are other options here too, that help you edit the copyright text and allow you to add an ‘As Seen On’ section. Listings are the focus of your website. But, before we jump to creating a listing, let’s create a listing category. This will save us the trouble of having to edit the listing after creating the category. Creating listing categories is pretty simple. It’s just like creating categories for posts in WordPress. Go to Listings -> Listing Categories and add new categories. To create a listing, go to Listings -> Add New. Categorize the listing under ‘Listing Categories’… and publish the post! Your new listing should be created. Users of your site can create a listing from the frontend itself, using the ‘Submit Listing’ page. PRO TIP: If you’re wondering how you can add the ‘Basic Amenities‘ section, you can do so using the WP Job Manager – Tags plugin (to add amenities as tags). You should get all of this above information by googling for the listing location. If you do not add this information, the location will not be marked on the map shown on the ‘Listings’ page. First things first, to display the map on your listings website, you’ll have to create and set a Google Maps Geocoding API key. You could optionally add additional elements in a sidebar on the Listings page, by adding widgets under Appearance -> Listings -> Listings Archive. Now, if you head over to ‘Submit Listing’ page, you should be shown the submission form directly. But if you notice on the Listify demo page, there are ‘Purchase Packages’. These purchase packages are created as products in WooCommerce using the WC Paid Listings plugin. Set the price, ‘Listing Duration’ (if applicable), and publish the product. Apart from customizing the theme’s background, there are tons of other options available to customize the look of the theme under Appearance -> Customize. If you’re good with the default look, you can leave the theme customization settings as is. To customize the theme beyond the options available, such as creating custom templates for Listify, you’ll need to contact a theme developer. For those of you who have used Listify to create their website, feel free to post any information that could be of help to our readers. You can’t deny Airbnb’s incredible popularity spurt. Since its launch in 2008, it grew to a $1 Billion company in merely three years. Today it contains over 800,000 listings in around 192 countries. Airbnb has taken advantage of “sharing economy” – a trending business concept – and one which certainly holds space for more players. “The next wave of opportunities in businesses will be companies that look at how we support the development of the sharing economy,” says Sundararajan a professor at New York University’s Stern School of Business. If you’re thinking of setting up a local Airbnb type of business, it is – without a doubt – a great idea! 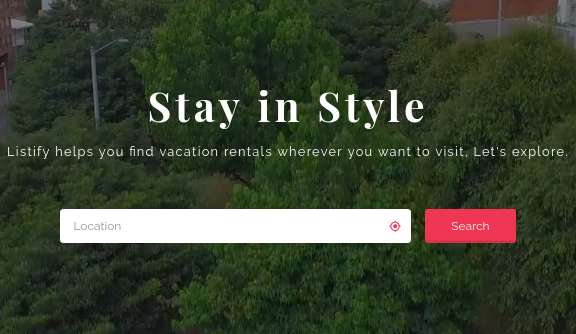 So, what does it take to convert that idea into a living breathing website like Airbnb? Could it be as simple as using WordPress and a directory theme? Well, I don’t know about using just any directory theme, but a theme I can vouch for is- Listify. (No I’m not an affiliate. And Astoundify hasn’t paid me to promote the theme. My evaluation is purely based on my own research and discussions with my WisdmLabs workmates who have first-hand experience working with the theme). If the long list of features does not convince you, the 4.5 rating, 3,000 purchases in less than 6 months, and 5-star reviews by WordPress community experts will surely catch your eye. Listify is a top rated and popular directory theme. It’s compatible with several WordPress plugins (the WP Job Manager and WooCommerce plugins are required with the theme) and booking services as well. To add to this, Astoundify provides detailed documentation, and several hooks and settings to customize the look of the theme. Create Listing Packages… and so on. For every listing you create, you can add details about the location, add images and reviews, just like you would see on Airbnb. If you’re one of those who is thinking the plugin dependency is an overhead, it’s quite the contrary! WooCommerce provides you with numerous benefits. To begin with, you have a plethora of payment gateways at your disposal. You have the WooCommerce Bookings add-on which can be used to set up your bookable products (rooms, rentals are bookable products). Another advantage is the WooCommerce Social Login add-on which similar to Airbnb, allows users to use social login during checkout or for the account creation process. As you know, Airbnb offers a killer search option. Listify comes awfully close providing zip code-based searching and several filters based on tags. With the WooCommerce Bookings plugin, you can offer a calendar search option as well. (If you’re hoping Listify provides the interactive map like Airbnb, it, unfortunately, does not. But with some custom development you can include that feature too). The wishlist feature in Airbnb is a lure for interested travelers. It provides them with an option to mark a listing they would want to book. The bookmarking feature in Listify theme is similar to the wishlist feature. You can spot it easily on a Listify website, because it employs a similar heart-shaped icon to bookmark listings. Airbnb’s exceptionally user-friendly interface displays seamlessly on mobile devices as well. And you would have the same experience if you used the Listify theme. No worries there. The Listify theme provides you with an added bonus as well. The theme’s code is search engine optimized to make sure you’re website fares well in search results. If there are any shortcomings, I’d say it was the Listify Theme’s tagline- “The last WordPress directory theme you will ever buy”. The theme is great. I love it. But that tagline is lame needs improvement. But in fact, there’s genuinely no reason to keep looking for a different theme. The theme is cleanly coded, provides adequate hooks and filters (explained with code snippets in its documentation) to customize the theme. And with the latest update (v1.0.3) you now have color schemes for maps! If you need help with the Listify theme, you can contact our awesome team of Listify developers for any assistance.